Under the disturbed land we understand the value that reflects the ratio of the reforestation fund area to the area of forest lands (on the forest fund lands and other land categories, where forests are located). Reforestation Fund consolidates the areas of forest land with stands, damaged by fires, pests and logging. Forest land in contrast to non-forest one represents a category with the following main functions: cultivation, conservation, improving the properties of the main forest forming species. The major part of the forest land is forested and the rest is not covered by forest (burnt areas, dead stands, slashes, clearing sand wastelands). There the reforestation measures are conducted, thus, they contribute to natural regeneration. 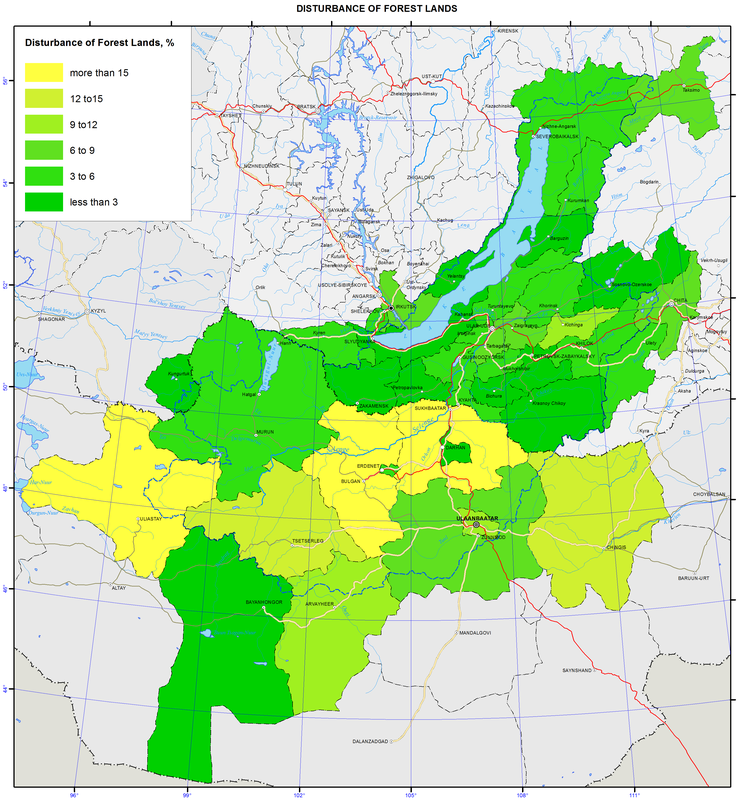 On the territory of the Russian part of the Baikal basin, the average disturbance of forest land is 6.1%. It is fluctuating from 0.06 % in the Krasnochikoysky district of Zabaikalsky krai to 9% in the Kizhinginsky district of the Republic of Buryatia. In the Mongolian part of the basin, the disturbance of forest land is higher than in Russia – on the average 9.7%. However, in aimags it is fluctuating from 0.1 to 19.9 %. In six aimags the disturbance of forest lands is more considerable – more than 10%. Such a situation in Mongolia is possibly caused by more accurate description of forest areas with damaged forest stands.